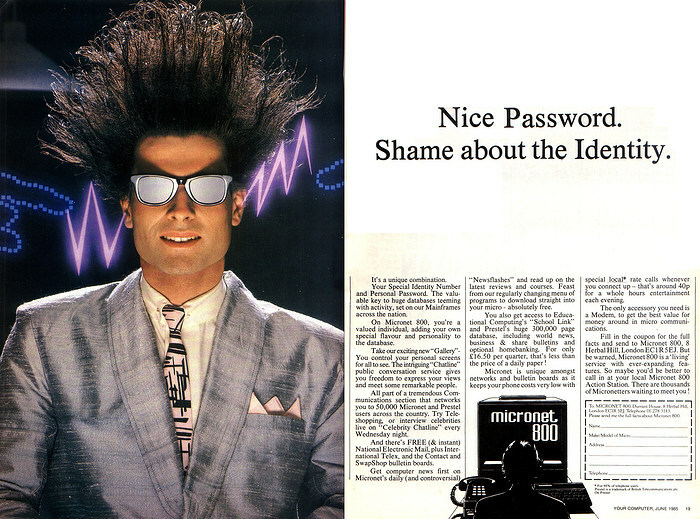 With an advert containing a theme still relevant to a modern audience - pointing out that "your special identity number and personal password [are] the valuable key to a huge database" - Micronet 800 was a subsection of Viewdata dial-up system Prestel, with a particular focus on personal computers, as well as international Telex, bulletin boards and email. When Prestel first launched in 1979, it already had the inherent ability to send email but the feature was kept largely secret because of political and labour considerations - at the time the nationalised and unionised GPO was running the system and it wanted to protect its postal monopoly. The US Postal Service faced a similar threat, but over there the networks - which included the two biggest, The Source and MicroNET - were private so they just went ahead an implemented email anyway. Micronet started out life as a Prestel project of East Midlands Allied Press (EMAP), but it was making a loss. Richard Hease, the owner of ECC, the publisher of Educational Computing and partner in modem manufacturer Prism Microproducts, became involved with the project after ECC had sold some of its publications to EMAP. He was given the job of making the service pay its way or to close it down. Hease came up with the idea of providing a computer user's database, offering telesoftware, news and on-line shopping, and managed to get the backing and investment of both Prestel and the Department of Industry, with the whole thing coming together within a matter of weeks. Hease was impressed, stating that "both Prestel and the DoI moved faster than I've ever seen a government or bureacratic organisation move". 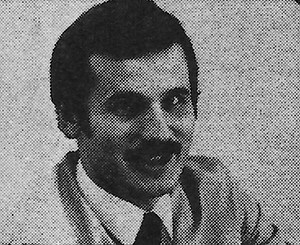 Bob Denton of Prism, © Popular Computing Weekly, September 1983Meanwhile, Bob Denton, former cash-register manufacturing company employee, had switched industries to become UK marketing manager for Texas Instruments, during which time he oversaw the launch of the ill-fated TI-99/4. He then moved on to help launch Mattel's Intellivision before becoming involved with Tandata's also-failing Prestel operation, and after that went on to become Dragon's director of Sales and Marketing. In April '82, Denton launched a Prestel-based electronics magazine called Electronics Insight and subsequently met Hease, whereupon the two realised their shared interest in Prestel networks. In June 1982, EMAP's Prestel division, known as Telemap and which was already a top-20 Prestel information provider thanks to its 60,000 accesses per month from 18,000 users, bought up Electronics Insight and the two systems went on to form the basis of Micronet 800 - the 800 being the page number in Prestel where the service was originally located. Their combined 3,000 Prestel pages quickly increased to 30,000, thanks to 28 London-based full time staff and 30-40 home workers, in time for the service's 1983 New Year launch. Later on, everything moved on to a GEC 4082 mainframe which allowed the service to support up to 120,000 additional pages, if it needed to. Prism was in a useful position to do something about one of the biggest problems holding back the service - the lack of adapters. It had made its name when it was appointed, only seven weeks after it had been founded, as the sole distributor for Sinclair, and was already planning to move into other software and hardware, so moving on to also manufacture Prestel adapters and modems - for "every micro [with] a population greater than 25,000", according to Denton - was therefore a fairly natural progression, especially given Denton's time at modem-manufacturer Tandata. It had big plans too, which it was expecting would cost the Micronet Consortium - Prestel, EMAP, ECC and Prism - around £3 million to get started and another £500,000 per year to keep it running. Denton said of this that "We are probably not going to make a big profit in year one. What we have to do is make it as painless as possible to join and to provide a wide range of services". At the time it was selling more than 350 ZX81s per day, but perhaps Denton was getting a little carried away when he stated "Our privileged position with Sinclair to some extent will make Prism the arbiter of which add-ons and software are and are not bought. Prism has both ends of the market and intends to become very much a force to be reckoned with". Micronet demonstration of teleshopping in 1988, © Personal Computer World February 1988The service was unveiled in the summer of 1982 and although it had been planned to launch on January 1st 1983, it didn't technically open until February 21st. It fully launched publicly in March 1983 and within two months was already using half of its initial maximum allocation of 30,000 Prestel Frames of data, with over 1 million accesses in April alone. It was hoping to reach its target of 12,000 users by the end of 1983 and was running at the rate of 1,000 subscriptions a month since its very first user - estate agent Jeremy Dredge - had logged on. Although it wasn't the first part of Prestel to be aimed specifically at microcomputer users - that accolade went to the Amateur Computer Club's ClubSpot pages - it did become the largest, to the extent that it became so important to Prestel's overall subscriber base that Prestel eventually invested directly in it, rolling it up with ClubSpot and ViewTel into a single area called, unoriginally, "Prestel Microcomputing". By the time of its fifth birthday in March 1988, it was up to 50,000 pages - nearly a sixth of the whole of Prestel. New subscribers were tailing off, so Micronet was starting to look for new markets, such as its Bizznet service, with a 4p per hour surcharge. 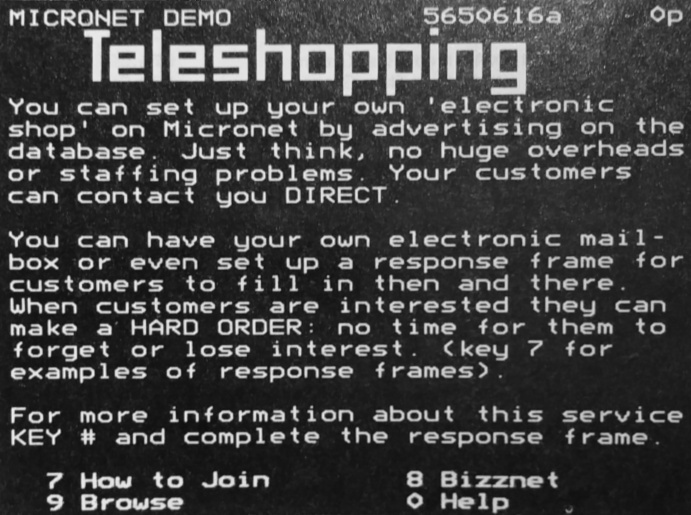 Bizznet also included what Micronet called "teleconferencing" - not in the video sense, but based on the chatrooms that had been pioneered by CompuServe in the US. Electronic communications in general were catching on, with a surge in the availability of cheap modems, and with 139,000 messages being sent per week even on Prestel's primitive email system. Micronet initially cost £66 per year to subscribe (£200 in 2019), but was down to £52 a year shortly afterwards. It was also subject to hourly phone charges of at least 40p an hour, rising to 60p by 1988 (this was the cheapest rate, available during evenings and weekends), which was nearly £1.50 per hour in 2017 terms. On top of that, there were often pay-per-view charges on content for the wider Prestel - up to a maximum of 50p per frame - although most of Micronet was "free". If nothing else, it was an order of magnitude cheaper than the House of Commons' online information system, launched in early 1981. Although free to parliamentarians, this was also available to the wider masses, as long as they could stump up the £1,990 (£8,130) annual subscription and £55 (£220) per hour connection fee. It was also possible to download software from Micronet, with Acorn being an active promoter of Prestel adapters for the BBC Micro for this reason. 25 new programs were added to the library in March 1983 alone, although unlike the other supported computers which had at least 100 programs each, finding copyright-free software for the BBC Micro was proving somewhat harder. Acorn was selling both add-on adapters and even partnering with spin-off company Torch, which built a whole computer (the Torch Communicator) around a BBC with Prestel. Acorn also launched its own 1000-page Viewdata service in April 1985, containing information on stuff like product news, software, upgrades and dealer locations. It ran on three BBC Micros linked via Econet to a hard disk unit and was available 24 hours a day, seven days a week, unlike many data services and bulletin boards of the time which were run by enthusiasts using their parents' phone, so were often only available from 6pm to 6am. By 1987, major software houses were signing deals with Micronet to produce telesoftware for the service. This included Firebird and Code Masters, whose signing-up in November 1987 gave subscribers access to any of their "hot off the press" titles with up to 25% off the usual price of £1.99. There were no immediate plans to sign up more budget software providers, although Micronet was keen to eventually have as many as possible on its books. Firebird's publisher Chris Smith enthused "budget software is an impulse buy and telesoftware is the ideal environment for it. Priced as low as £1.50 on Micronet, Firebird's software is unbeatable". When Micronet launched, subsidised networking interfaces comprising an acoustic modem, power pack, cables and software were offered to the first 10,000 subscribers for £49 (£150). In February 1983, adapters were available for the BBC Micro and the Tandy "CoCo", with Spectrum and Dragon versions supposedly becoming available in March, although Personal Computer News was reporting in March that the Commodore PET, Apple's I and II and Research Machines' 380Z as well as Tandy's TRS-80 models 1 and 2 could be hooked up. The advert suggests that there were 50,000 Prestel subscribers as at June 1985, of which 20,000 were accounted for by Micronet (at its height). The highest number of subscribers Prestel ever had was thought to be about 90,000. Despite that, Micronet did claim the milestone of being the first Prestel service to register over 1 million accesses in a single month in 1983 - just as three more micros were confirmed as able to connect to the service - the Spectrum (via a Prism VTX 5000 modem), Apple II and TRS-80. Also available were adapters for Commodore's 64, 500, 700, 3000, 4000, and 8000 machines and some more esoteric micros, like ICL, RAIR, Superbrain, Nascom, NewBrain, Lynx and Osborne. Micronet even won a "Recognition of Information Technology Award", or RITA - a sort of IT Oscar - for Systems Innovation of the Year at the 1984 Which Computer? Show. Reviewing the VTX5000 in Personal Computer News, John Lettice (who would later write for The Register) summed up "if the Prism does the same for other micros, the acoustic modem would certainly seem to be on the way out, and as far as the Spectrum is concerned the VTX5000 represents a giant step. It isn't simply a tool for letting the machine be used with Micronet - it's a route out in to the big wide world and it will at least start the Spectrum off in the direction that micros will be taking through the home information revolution". Prestel was sold by BT in 1994 - the year before that whole "World Wide Web" thing really started to kick off in the UK. Meanwhile, another option for the seriously hard-core Bulletin Board System (BBS) user, or just those worried about racking up huge phone bills - especially if you wanted to do anything as exotic as contact a BBS that was abroad - was packet radio. This used a version of the X.25 packet-switching protocol - hence the name "packet radio" - called AX.25, a system similar to the X.25 found in leased-line networks and much like that used in PSTN telephone systems. Another alternative was something like the Dutch Computer World interface for the humble VIC-20, which allowed the 3.5K micro to receive, decode and transmit Morse code or RTTY (Radio Teletype), the latter from 45 baud up to 300 - the average speed of a regular dial-up modem at the time. The drawback of connecting over radio was that it did require yet another modem as well as an amateur radio licence, which required six-month-long City & Guilds courses, £12-per-annum fees and most likely membership of the Radio Society Of Great Britain (RSGB). Nevertheless, modems were available such as one from unfortunately-named Vomek Software which retailed for about £300 (£910). Whilst connecting to 1200-baud half-duplex packet radio (which meant it could do 1200 baud but in only one direction at a time) was considered perfectly fine, less clear was the legality of setting up a BBS on packet radio, as the regulations implied that the licenced operator must be in attendance. The U.S. was much less regulated in this respect. In Vermont, for example, a network of Commodore 64s had been set up to relay tourist information over the air, and it was possible to receive financial news over the air in 36 major cities across the country. Modems in the States were also significantly cheaper, costing around $200, or about £400 in 2019 money. American modem giant Hayes (which gave its name to the control protocols used by almost every modem made since) was on the cusp of launching its modems in the UK during the early summer of 1985, but the labyrinthine BABT approval process was being blamed for delays. Hayes' first product was to be a 1200 full-duplex modem. If being a radio ham wasn't an option for the aspiring Prestel competitor, ACT, the company that acted as distributor for Chuck Peddle's Sirius back in 1982, was offering its own Apricot Xi10S micro which could support up to 8,000 pages of Viewdata information to up to 200 terminals, included full Prestel compatibility. The base Xi10S came with a 10MB hard disk and 512K RAM, plus colour graphics card, monitor, viewdata software and multiplexor (which allowed multiple simultaneous incoming connections) all for £9,930 (about £30,400 in 2019). ACT's managing director Tony Bryan said of the price "Until now, businesses requiring such a service have had to invest in minicomputer systems costing upwards of £100,000". Potential users were expected to be mostly the usual suspects of finance, banks, building societies and travel agents as well as, perhaps optimistically, agriculture. Personal Computer News quipped "we expect the number of farms requiring 200 terminals to be strictly limited". Similarly, a computer from Acorn spin-off Torch was being used to run a system in the Western Isles of Scotland. Containing 3,500 pages on a hard disc, some of which was in Gaelic, outlying schools in the remote Western Isles region could connect using their BBC Micros. As of Autumn 1984, 26 schools had the required gear with the remaining 44 expected on-line soon. 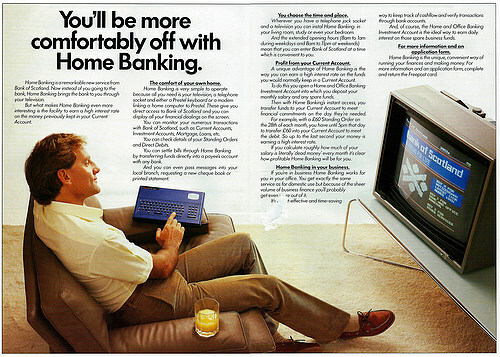 On-line banking from the Bank of Scotland, © Personal Computer World November 1985Also in 1984, Prestel was subject to a famous early hacking case, when Robert Schifreen and Stephen Gold, who described themselves as freelance journalists, hacked into various parts of Prestel, including the mailbox of the Duke of Edinburgh. Predating any sort of actual computer mis-use laws, the pair were committed at Southwark Crown Court under Section 1 of the Forgery and Counterfeiting Act 1981. Schifreen, who had broken in to Prince Philip's mailbox and had even impersonated the Duke in email replies, had made the mistake of selling his story to the papers. The pair were arrested following a "late-night swoop on their homes in London and Sheffield", with Schifreen being charged for "forging an electronic device for recording information" from Prestel computers known as Gateway and Kipling, whilst Gold had "forged computer discs" from information stored on Keats and Dickens. During the trial, it was revealed that Prestel's security relied on nothing more than a ten-digit user ID, followed by a 4-number password, whilst users with "top-level security" who could edit stuff only had to enter a second 4-digit password. Schifreen had used his BBC Micro to randomly type in a user ID of 2222222222 followed by a password of 1234 and was "surprised" to be welcomed as the user Mr. G Reynolds, who unfortunately for Prestel happened to be a user that had access to a testing facility that had access to all Prestel accounts. From there, Schifreen gained access to the royal mailbox - after all, as another hacker had put it "everyone and their granny was hacking the system" since it had emerged that Prince Philip had a Prestel mailbox in the first place. Schifreen had even reported these text-book security lapses to Prestel as far back as October 1984, with the hope of maybe getting a job offer. BT's response to the debacle, apart from adding wiretaps after Schifreen had reported the security holes, was to tip off Scotland Yard before changing all its suppliers' "Information Provider" codes as well as changing all the editing passwords to be the same as the intial password. The whole "security" set-up provided almost no real security whatsoever, which was especially surprising considering that Prestel was also home to the world's first Viewdata banking system. At first, it had been thought that there might have been a BT "mole" operating, who was supplying important confidential system information to hackers, with the allegations being levelled by Prestel's second-largest information provider, Timeframe International, which swiftly posted BT's claims against it in its "letterbox" - the front window in Prestel. BT responded by blacklisting Timeframe, claiming that there was a clause in its suppliers' contracts which meant they should not bring BT or Prestel into disrepute, an action which led to Timeframe starting on preparations for a retaliatory injunction against BT. The incumbent telco later backed down, but not before three hackers had used a VTX 5000 modem attached to a Sinclair Spectrum to break into ICL Telecom's mailboxes, with one of them claiming that the passwords needed had been left in his email inbox by someone signing themself as "BT Mole". The hackers had also accessed ICL's Telex mailbox and had sent Telexes to various ICL offices as well as Steve Clark, the news editor of ITN. Meanwhile, whilst BT was vigorously denying that there ever was a Prestel Mole, ICL had put in measures to thwart more hacking, with a spokesman suggesting that "Since the hacking, those mailboxes have had passwords put into them, so they are now protected". There was some support for Timeline's whistle-blowing actions from MPs (via post and not email) as well as the editor of Micronet's Micromouse database. It had originally been suggested by Popular Computing Weekly that hackers had broken into Micronet/Micromouse on the 2nd of December to promote support for Timeline, but it was actually the editor of the database who posted the message - with what could be considered a very early hashtag of "Bring back Timeframe *8181 # R A-OK" - with the full knowledge of Micronet. Schifreen and Gold were eventually convicted under the Forgery Act at the end of April 1986 and were fined £750 and £600 respectively, with £1,000 in costs each. They appealed immmediately, and as the appeal rumbled on at the High Court, it looked like they were actually benefitting from all the fame. Gold was interviewed at the 1987 PC User show and told Your Computer's Phil Rotsky that "It's done neither of us any harm. If it wasn't for all the publicity I'd probably still be freelancing part-time and working during the day as an accountant", whilst Schifreen had landed a job at a leading computer magazine. Their convictions were eventually quashed in the middle of July 1987, with their fines rescinded and them being awarded costs. They were reported to be "utterly ecstatic" at the result, whilst Your Computer noted that "if the duo's alleged activities had been more serious there might have been some point in bringing a prosecution, but regardless of the verdict it is difficult to see what this case has achieved. Schifreen and Gold's appeal had been on the basis that the "false instrument" upon which the case rested had not been clearly defined. This instrument ended up being indentified as the actual electronic impulses sent down the telephone line, which led Lord Lane, the Lord Chief Justice, to suggest that if it had been forgery, it was "of an unusual kind". It clearly didn't take long for the three appeal judges to quash the case, as Gold reported "We appeared in court at 10.00 [on July 17th] and by 10.30 we were looking for somewhere to buy champagne". Schifreen went on to clarify exactly what the case rested upon in a letter to Personal Computer World in its September 1988 edition, as confusion still seemed to reign over the whole affair. Referring to the uncertainty about what exactly the instrument was that the pair had forged, he wrote that BT and the police had never actually stated what the instrument was, but that a BT drone suggested that it would have to have been "an instrument in the user segment", as in part of the actual Prestel computer. This led to a something of a paradox, because the Prestel computer was also the machine that was being deceived by the false instrument, which is where the prosecution started to get tangled in knots. Schifreen continued "the other reason is this: the instrument that we allegedly forged is, according to the law, 'a disk, tape or soundtrack, or any other device on or in which information is recorded or stored'". The prosecution had argued that as passwords were held in the user segment for the purposes of validation, then that was the false instrument. The Lords, however, insisted that 'recorded or stored' should be given their day-to-day meanings, which implied being held for a fairly long time, which the passwords were clearly not. It was all very confusing. The outcome of the Schifreen/Gold case almost led to the release of a pair of "multi-million pound computer hackers" when their guilty charge for forgery had to be quashed, since the Prestel-hack case had set a precedent which meant that certain acts of forgery using computers were actually legal, albeit temporarily. The pair - Lamberti and Filinski - had used an ancient Texas Instruments Silent 700 data terminal to access secret data from Lamberti's employer Prudential Basche Securities and were planning to shift £5 million in Euro bonds to a Swiss account controlled by a criminal gang they both belonged to. Unfortunately, such transactions took seven days to complete and the fraud was discovered after five. Although charges for forgery were out, the pair were still convicted under a charge of conspiracy to defraud, and it also meant that the Crown punted the whole area of law to the Attorney General, Patrick Mayhew, for review. Between them, the two cases did achieve an eventual change in the law - in an interview with The Register in 2016 Schifreen suggested that "I think the police were quite happy that I was acquitted as it demonstrated the need for a computer hacking act of some sort. The Computer Misuse Act of 1990 resulted." The tables were somewhat turned on the erstwhile Prestel hacker during the summer of 1987 when Schifreen, who by now was writing for Personal Computer World, discovered that his Telecom Gold mailbox had been under observation since Christmas 1986. When Schifreen called the not-Stephen Gold up to ask why there were some strange open files on his sytem, including a tell-tale one called "SECURITY>VNU209.0" - Schifreen's user ID but with an extra ".0" on the end - he was met with the response "OK, it seems like we're monitoring your mailbox. Let me find out why and get back to you". Apparently, the monitoring had started after an unknown third party had accessed Schifreen's account and tried to access a file that users shouldn't even know about - a file which as it turned out was actually mentioned in all the manuals for the Prime mainframes that Telecom Gold ran on. Schifreen got some payback by referring to matter to the Office of Telecommunications - Oftel - which started investigating BT under the terms of the Interception of Telecommunications Act 1985, as well as its operating licence. In modern terms, the Prestel hack was clearly not a hack, as trying out a few random numbers on a system so devoid of any real security can hardly be compared to state-sponsored operations like Stuxnet, which briefly shut down Iran's entire nuclear programme, and clearly it did little to encourage other industries to beef up their security, as demonstrated nicely when a couple of years later a 17-year-old managed to steal nearly £1 million from his employer - the National Westminster Bank. NatWest junior clerk - Tim Fox - had first used the bank's computer to move just over £12,000 of customers' cash into his own account. Emboldened by the ease and the subsequent lack of detection of his deeds, he went on to move an additional £948,252 into the account of a friend, whereafter the two immediately went on a champagne and electric-guitar spending spree. It was only after Fox admitted the original fraud that the bank knew anything about it, with Fox going on to 'fess up to the bigger deed after NatWest launched an extensive probe. Fox and his friend, who had paid back all but around £15k of the stolen loot, were eventually sentenced to 12 months' youth custody, but the judge pointedly refused to order them to pay the rest of the money back, stating that it was clearly a poor indictment of banking computer security that a kid just out of school could "work [the] system in Nat West on a number of occasions without being found out". The case coincided with a government review which suggested that computer hacking be made a criminal offence, and that infecting computer systems with a virus should be "made illegal". The Treasury and the Bank of England had instigated the government committe as it was becoming clear that some computer hackers were getting quite handy at breaking into banking systems and generating their own PINs for stolen cash-machine cards. Back in 1987, Prestel - which was never financially successful - picked up some competition towards the end of the year in the form of Istel. Istel was a successful national Viewdata network that had been set up by automotive basket-case British Leyland, which by 1987 was known as Austin Rover, to provide a dealer communications network. It was sold in the autumn of 1987 to a management and employees consortium which was backed by financial institutions such as Lloyds Bank, Kleinwort Benson and Barclays, for the sum of around £75 million - not bad for a network that almost no-one had heard of. Anyway, if nothing else this advert warranted an inclusion on account of its staggering 1980s-ness.